Michael Mathis wasn’t satisfied with the career options available to him after receiving his high school diploma. “I was the manager at Foot Action, selling shoes like Al Bundy,” he said. When the store closed five years later, Mathis switched jobs. Mathis, a senior sport and recreation management major, lives with a learning disability that makes the academic tasks that some take for granted a challenge. Mathis graduated high school in the late ’90s. Mathis is now able to compete as a college student, partly because of recent strides in Assistive Technology, a name given to the software used to supplement the academic careers of students living with physical impairments and learning disabilities. Students with physical or learning disabilities can register at Disability Resources and Services to take advantage of these resources. Currently, 2,800 students are registered, a number that has grown over the past few years due to students getting diagnosed with learning disabilities, Student Services Coordinator Patrick Gordon said. Of the 2,800 students, 65 percent have learning disabilities. Mathis’ study process gives new meaning to the phrase “crack open the books.” Due to his reading deficiency, he learns with the aid of a computer program called Kurzweil 3000. The program works with a device that scans textbooks and assigns a computerized voice to relay the content to users. The spine of the textbook is taken apart and replaced with metal rings, a binding that will allow special hardware to scan the pages of the book and send the information into Kurzweil. The process makes a normal study session a tedious task for students in need of assisted technology, but Mathis has grown accustomed it. However, users can forgo the scanning process if a digital copy of a textbook can be located on the Internet. “I can go online, take the syllabus, type in the name of the textbook and see if I can find a digital copy,” Mathis said. Kurzweil 3000 is a versatile piece of equipment – the program can read text from PDF files, Microsoft Word and PowerPoint documents, Web browsers and almost any computer program. Users can choose a male or female text-reading voice and stop, fast-forward or rewind the reading at any time. Gordon works with students aided by Disability Resources and Technology, the branch of Temple that distributes Assistive Technology to needing students. “Our job is to offer accommodations for when students are in the classroom, for when students are taking exams, when students are having difficulty reading, things like that,” Gordon said. Gordon works specifically with Assistive Technology. “I train students on technology, install software and work with Computer Services, and just make sure that students are getting the accommodations that they’ve demonstrated a need for,” he said. 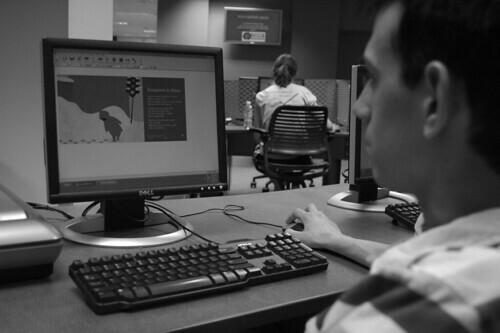 Certain Assistive Technology programs like Kurzweil 3000 are available to all students in the TECH Center. However, the majority of students living with learning disabilities at Temple still register with Disability Resources and Services. Assistive Technology also includes voice recognition software like Dragon Naturally Speaking, a program that aids students with impairments that disallow students from typing. Hearing-impaired students can be provided interpreters, and students with learning disabilities often benefit from hiring tutors. While Temple does not pay for students to install pricey Assistive Technology onto their home computers, students with sensory impairments and learning disabilities can apply for scholarships available to them through Disability Resources and Services. The Charlotte Newcombe Scholarship Fund is available to disabled students with proper documentation who are in need of financial assistance and maintain at least a 2.0 GPA. The amount offered for the award varies, as do the resources for which students use the money. “I used that last semester for a tutor,” Mathis said. Mathis’ dream job is to work for the Dallas Cowboys, although he is also interested in working for a company like GM at a hands-on job where he can use the programs he has become familiar with. “A lot of companies will make exceptions, get these programs for you,” he said. A graduating senior, Mathis went to Career Services’ internship fair dressed in a full suit. Caitlyn Conefry can be reached at caitlin.c@temple.edu. City universities are unwelcome pariahs who gentrify and litter as they go, or economic saviors who enhance a neighborhood, depending on whom you ask. As with most controversies, the truth lies somewhere in the middle. Is that bias for Hillary Clinton or Barack Obama? It seems Sen. Hillary Clinton is under constant attack, columnist Chris Stover notes how it affected yesterday’s primary.